No more puddles. No more wet floors. No more germs. Flooring in your facility varies from room to room, but whether it's wood, tile, rubber, or turf, it's got to stay clean for members to get the right impression. Locker rooms and showers require a bit of extra attention as they are often wet. A great way to maintain rooms that fight the battle against wet floors is with Dri-Dek®—the self-draining floor system. While sprays, treatments, and floor finishes are important, they wear out. 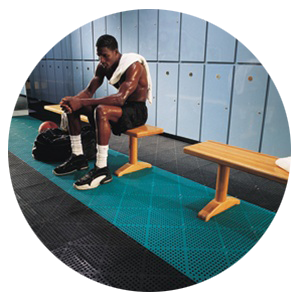 Dri-Dek fights germs and wet floors with its patented interlocking tile design. Each tile has a knobby, perforated surface that allows water to drain through the surface. This also lifts guests above wet floors, so even by the pool your members will have a dry surface to walk on. Pitched floors will naturally drain water, but a quick pressure wash is enough to clean Dri-Dek flooring. So Dri-Dek creates a water-free surface, but how does it fight germs? Technically speaking, Dri-Dek is made of oxy-B1 vinyl that inhibits a microorganism's to absorb oxygen. Simply put, when germs don't have an oxygen supply, they die. This vinyl material is also bonded into Dri-Dek's primary material, so you won't have to worry about any treatments wearing out. Say hello to your new weapon against mold, mildew, and bacteria. Assembly is a breeze—Dri-Dek tiles and sections interlock with an easy tab/pin system. This can be done by hand or with a hammer for larger installations. That's it! The modular qualities of Dri-Dek open up a world of possibilities for configurations, layouts, and seamless cover wherever you want to put it. There are sheets, tiles, edges, and corners to help you build the exact shape you need. Quiz: Is it time for a facility upgrade?